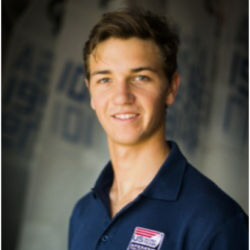 Luke Muller is a sophomore at Stanford University and currently sails the Finn for the US Development Team. From a family of windsurfers, Luke grew up on the east coast of Florida in Martin County sailing anything from Optis, 420’s, and even Windsurfers. His size led him to a few good years in the Laser but has recently graduated to the Finn Class. The short-term goal is to qualify for the US Sailing Team – Sperry and hopefully qualify for the Rio Olympics. Luke hopes to align his schedule to achieve maximum growth in the Finn Class in the next year. The ultimate goal is to win Gold in Tokyo.